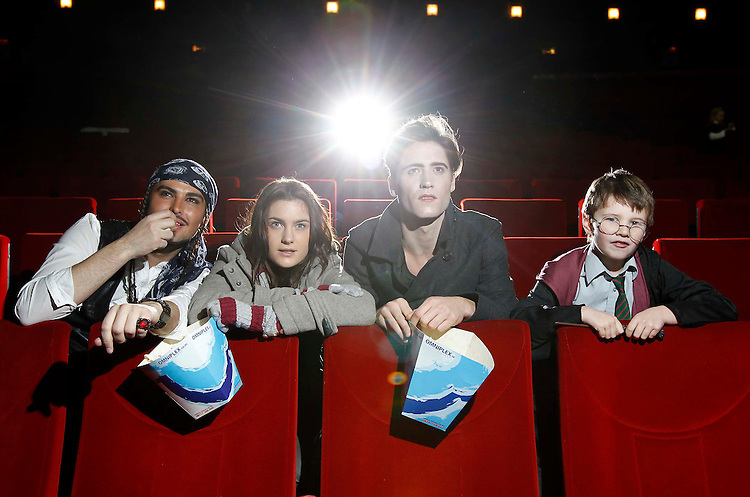 OVER EUR10m IN FREE CREDIT AND FREE CINEMA TICKETS FOR PREPAY CUSTOMERS AS O2 LAUNCHES NEW OFFER.No Repro Fee.....Cinema characters, Jack Sparrow (Sean Paul Gillbride), Twilight's Bella (Rochelle MacIntyre) and Edward (Will K) and Harry Potter (Mark Perrey, aged 7) all from Dublin, pictured at the announcement of the O2 prepay offer which will see it give away over EUR10m million worth of free credit in the first six months of the year. New prepay customers joining the O2 network and O2 customers upgrading their phone can avail of EUR20 free credit every month until June when they top up each month by EUR20. The offer also includes two free cinema tickets which can be used any time each month in a wide range of cinemas across the country. Details can be found at www.o2.ie/cinema . .